As employers, we are used to assessing qualifications and experience, and even using psychometric tests to tell us what people are competent of in terms of their skills and their preferred behaviours; but they don’t tell us about when or even whether they’ll fully apply all that they are to their job, now or in the future. This requires an understanding of what motivates them –where they will, or prefer to, focus their energy and effort. As a licensed practitioner of the motivational maps® self-perception inventory, GrantaHR are able to offer this insightful and thorough feedback to help you understand not only what motivates your people and teams but uniquely also how well motivated they feel. With this understanding employers are able to apply this knowledge to operational and strategic performance management decisions; for instance to resolve causes of conflict, re-align individual/team performance expectations, improve internal communication, manage change more effectively, structure roles and teams to maximise strengths, devise effective reward practices, and importantly invest in people wisely. Equally important is being clear on the performance standards and activities you want so you can reward and incentivise achievement, and manage underperformance quickly. GrantaHR can guide you to provide the structure for how you manage performance in ways that are right for your business. Effective graduate and trainee development programmes. 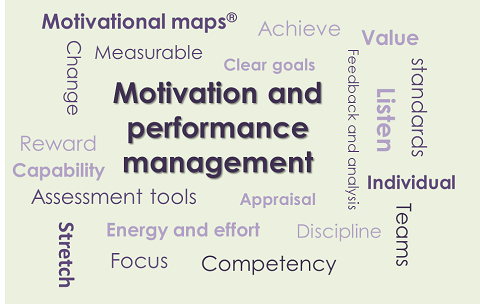 If you would like to know more about these or any other aspects of motivation and performance management, please contact us or ask about our free HR Health Check.